Diwali the festival of lights is coming soon and Singapore is already welcoming this with beautiful decorations in Little India and MRT’s. Today’s post is Minnie Mouse Rose Kaju Katli - Cashewnuts are combined and cooked with sugar syrup & rose essence. 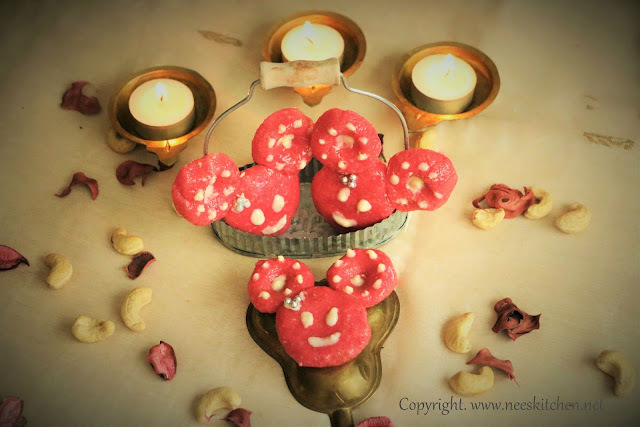 The kaju katli is then shaped into minnie mouse cartoon character and decorated with white chocolate. A special treat for kids!!! This was my guest post to Plattershare who wanted me to create an innovative traditional recipe which is appealing for kids between 0 - 7 years. Thanks to the team for this opportunity. Having a daughter at home the only thought which came up in my mind is that the recipe must be pink in color. So the immediate character which came into my mind was Minnie mouse. Since it was holiday time, I called up some neighborhood kids to help me out to design the kaju katli. So many ideas were given, some wanted a standing Minnie mouse while some wanted only the face. Even in the face some wanted oval shape and the rest wanted circle shape. I actually wanted to do different shapes but only one shape and model turned out to be perfect and did not break even after 30 minutes. So we finally landed up with circle shaped Minnie mouse. It was a real fun activity and all were waiting for their share. Within no time after the shoot all the kaju katli’s vanished leaving just 3 circles left for the elders at home. 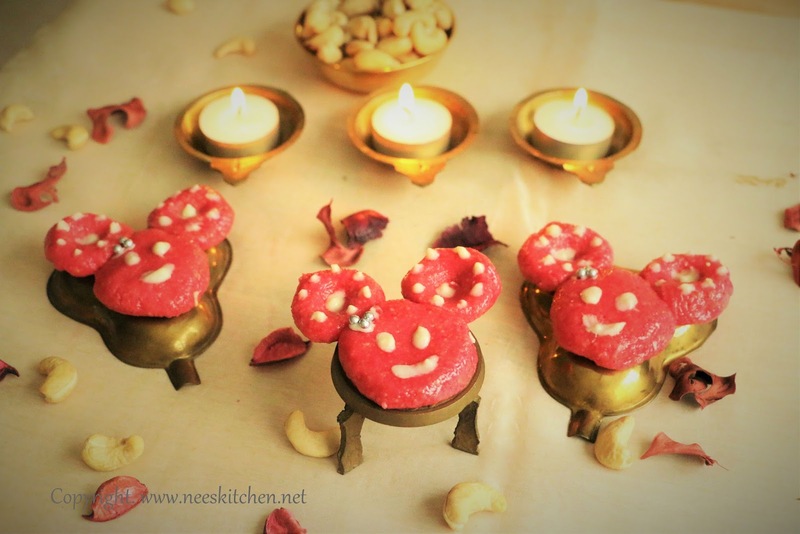 Coming to the recipe, it is a regular kaju katli recipe with rose color & rose essence added. One tablespoon of milk is mandatory in this recipe as it should not get dried while shaping them. For the decorations I use baking white chocolate which needs to be melted and some edible silver sugar pearls. 1. Powder the cashews and measure to make it as 1 cup. 2. Take a non-stick pan and add water. 3. Once the water is boiling add sugar and cook until it forms a string consistency when it is touched between two fingers. 4. Add the powdered cashews, rose essence and rose coloring and mix well until all the liquid is absorbed. Keep mixing until it forms like a dough consistency. 5. Add milk and mix again. Adding milk in optional in regular kaju katli and we do it only if it becomes dry, however for this recipe it is a must to add as we are going to make them into shape. 6. The shape of the Minnie mouse comes well only while the dish is hot, hence we need to start shaping when the heat is bearable for our hand. 7. Greece your palms with ghee. 8. Take 1tblsp of the rose kaju katli and shape them like a ball and press in between you palm to make it a flat and thick circle. This becomes the face for the mini mouse. You may wish to leave it like a round shape face or make it slightly oval below the cheeks area. 9. Take ½ tblsp of the rose kaju katli and them like a ball and press in between you palm to make it a flat and thick circle. This becomes one ear of the mini mouse. Make the second ear also in the same way. Measuring is important to get the right shape, hence do not ignore the measurements. 10. For the ears make a small dent by pressing a finger in the middle. 11. Join the face and the ears. They will get stuck well easily as they are still hot / warm. 12. Repeat it for the entire kaju katli mix. 13. Refrigerate for 30 minutes. This would help the shape to be intact. 14. After 30 minutes, take baking chocolate and melt it. Melt it using a ceramic chocolate melting hot pot with a candle below. 15. Take a chop stick and dip the smaller side into melted chocolate. 16. Start putting polka dots surrounding the ears and also in between the dent of the ear. 17. Start putting the eyes and mouth with the melted chocolate using the chopsticks. 18. Allow the chocolate decorations to be stay in the kaju katli for few minutes so that they would get stuck well with the dish.